^ Royal Arsenal. Football Club History Database. [2007-05-04]. （原始内容存档于2007-03-14）. ^ 8.0 8.1 8.2 Woolwich Arsenal. Football Club History Database. [2007-05-02]. （原始内容存档于2007-03-11）. ^ Five Ways to Compute the Relative Value of a UK Pound Amount. MeasuringWorth.com. [2007-05-29]. （原始内容存档于2007-05-31）. ^ 17.0 17.1 England 1914/15. RSSSF. [2005-05-03]. （原始内容存档于2010-02-05）. ^ Did Bobby Moore win the US League with West Ham?. Guardian Unlimited. [2007-05-02]. （原始内容存档于2007-01-10）. ^ England 1923/24. RSSSF. [2007-05-02]. （原始内容存档于2012-07-15）. ^ London Underground and Arsenal present The Final Salute to Highbury. Transport for London. [2007-05-03]. （原始内容存档于2007-09-30）. ^ 29.0 29.1 29.2 29.3 29.4 29.5 Arsenal. Football Club History Database. [2007-05-02]. （原始内容存档于2009-11-06）. ^ Classic Cup Finals: 1927. TheFA.com. [2007-05-03]. （原始内容存档于2008-07-08）. ^ Wales On Air - The 1927 FA Cup. BBC Wales. [2007-05-03]. （原始内容存档于2004-12-20）. ^ Cardiff's 1927 FA Cup Victory. BBC Wales. [2005-06-07]. （原始内容存档于2006-05-28）. ^ FA Cup Final 1932. FA Cup History (unofficial site). [2006-06-27]. （原始内容存档于2007-03-11）. ^ Third Round upsets. TheFA.com. [2007-05-03]. （原始内容存档于2008-11-23）. ^ England 1934/35. RSSSF. [2007-05-03]. （原始内容存档于2007-08-08）. ^ Most Players from a Single Club in an England Team. England Football Online. [2007-05-03]. （原始内容存档于2007-09-28）. ^ 44.0 44.1 Club Records. Arsenal.com. [2007-05-03]. （原始内容存档于2008-08-12）. ^ On this day in history ~ Division One, 1935. wsc.co.uk (When Saturday Comes). 2014-11-16 [2014-12-18]. （原始内容存档于2014-12-18）. 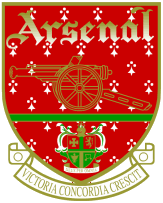 ^ ArseWeb on... Wartime Arsenal. Arseweb. [2007-05-02]. （原始内容存档于2007-09-27）. ^ 125 years of Arsenal history - 1941-1945. [2015-04-28]. （原始内容存档于2015-10-06）. ^ Soar, Phil & Tyler, Martin. The Official Illustrated History of Arsenal. Hamlyn. 2005: 69. ISBN 0-600-61344-5. ^ Season 1947–48. RSSSF. [2007-05-14]. （原始内容存档于2007-06-12）. ^ Season 1951–52. RSSSF. [2007-05-04]. （原始内容存档于2007-06-12）. ^ Season 1952–53. RSSSF. [2007-05-04]. （原始内容存档于2007-06-13）. ^ England in World Cup 1966: Squad Records. England Football Online. [2007-05-02]. （原始内容存档于2007-05-02）. Club History. Arsenal.com. [2007-05-13]. （原始内容存档于2008-08-12）. History of Arsenal FC. Arsenal-Mania. [2007-05-13]. （原始内容存档于2007-05-03）. The History of Arsenal Football Club. Arseweb. [2007-05-13]. （英文） Bernard, Joy. Forward Arsenal!. Phoenix House. 1952. （英文） Maidment, Jem. The Official Arsenal 100 Greatest Games. Hamlyn. 2005. ISBN 0-600-61376-3. （英文） Roper, Alan. The Real Arsenal Story: In the Days of Gog. Wherry. 2004. ISBN 0-9546259-0-0. （英文） Spurling, Jon. Rebels For The Cause: The Alternative History of Arsenal Football Club. Mainstream. 2004. ISBN 0-575-40015-3. （英文） Weaver, Graham. Gunners' Glory: 14 Milestones in Arsenal's History. Mainstream. 2005. ISBN 1-84018-667-4. （英文） Joy, Bernard. Forward Arsenal!. Phoenix House. 1952. （英文） Roper, Alan. The Real Arsenal Story: In the Days of Gog. Wherry. 2003. ISBN 0-9546259-0-0. （英文） Soar, Phil & Tyler, Martin. The Official Illustrated History of Arsenal. Hamlyn. 2005. ISBN 0-600-61344-5. （英文） Brown, Deryk. The Arsenal Story. 1899. ISBN 0-21316-312-4. （英文） Connolly, Kevin. The Official Story of Arsenal's Double Year. Headline Book Publishing. 1998. ISBN 0-7472-7544-0. （英文） Day, Bill. Arsenal. Macdonald Purnell. 1988. ISBN 0-361-08357-2. （英文） Emery, David. Gunning for Glory! The Full Story of Arsenal's Victorious 93-94 Season. Simon & Schuster Ltd. 1994. ISBN 0-671-71368-X. （英文） Finn, Alex. Heroes and Villains. Penguin Books Ltd. 1991. ISBN 0-14-014769-1. （英文） Finn, Ralf. Arsenal: Chapman to Mee. Hale. 1969. ISBN 0-7091-1068-5. （英文） Fisher, Keith. Arsenal Greats. John Donald Publishers Ltd. ISBN 0-85976-314-5. （英文） Goodwin, Bob. The Pride of North London. The definitive history of Arsenal-Tottenham 'derby' matches. Polar Print Group Ltd. 1997. ISBN 1-899538-04-6. （英文） Harris, Jeff. Arsenal Who's Who. Independent Magazines. ISBN 1-899429-03-4. （英文） Hayer, Reg. A Double First! The Arsenal Football Book No 3. FA Cup Winners League Champions. 1899. ISBN 0-91082-803. （英文） Hayter, Reg. The Arsenal Football Book. S Paul. 1971. ISBN 0-09-108280-3. （英文） Hayter, Reg. The Arsenal Football Book (Board Book). S Paul. 1974. ISBN 0-09-121000-3. （英文） Kelly, Stephen. The Highbury Encyclopedia.An A-Z of Arsenal FC.. 1994. ISBN 1-85158-659-8. （英文） Lawrence, Amy. Proud to Say that Name : the Marble Hall of Fame. Mainstream Publishing. 1997. ISBN 1-85158-898-1. （英文） Lemmon, David. Arsenal in the Blood. Breedon Books Publishing Co Ltd. ISBN 1-85983-130-3. （英文） Miller, H. Arsenal. The Champions Year.. Partridge Press. 1990. ISBN 1-85225-122-0. （英文） McGarrigle, Stephen. Green Gunners. Mainstream Publishing. ISBN 1-85158-442-0. （英文） Ollier, Fred. Arsenal: A Complete Record. Breedon Books Publishing Co Ltd. ISBN 1-85983-011-0. （英文） Ollier, Fred. Arsenal: A Complete Record 1886-1988. Mainstream. 1988. ISBN 0-907969-41-0. （英文） Ollier, Fred. Arsenal: A Complete Record 1886-1990. Breedon Books Publishing Co Ltd. 1990. ISBN 0-907969-77-1. （英文） Ollier, Fred. Arsenal: A Complete Record 1886-1992. Breedon Books Publishing Co Ltd. 1992. ISBN 1-873626-12-6. （英文） Pardoe, Rex. The Battle of London : Arsenal versus Tottenham Hotspur. T Stacey. 1972. ISBN 0-85468-150-7. （英文） Ponting, Ivan. Arsenal Player by Player. Hamlyn. 1996. ISBN 0-600-58909-9. （英文） Rippon, Anton. The Story of Arsenal. Moorland Publishing. 1981. ISBN 0-86190-023-5. （英文） Rivoire, Xavier. Arsene Wenger: The Biography. Aurum Press Ltd. 2007. ISBN 1-84513-276-9. （英文） Robertson, John. Arsenal. Hamlyn. ISBN 0-600-50178-7. （英文） Simpson, Neal. Arsenal: A Pictorial Story. ISBN 1-87262-626-6. （英文） Wall, Bob. Arsenal from the heart. Souvenir Press Ltd. ISBN 0-285-50261-1. （英文） Watt, Tom. End - 80 Years of Life on Arsenal's North Bank. Mainstream Publishing. 1993. ISBN 1-85158-567-2. （英文） Weaver, Graham. G12-0 to the Arsenal (and a Goal in Injury Time). Mainstream. 1998. ISBN 1-84018-050-1. （英文） Whitcher, Kevin. Gunning for the double: the story of Arsenal's season: a Gooner Special. 1899. ISBN 0-95333-334-0.